Investment markets fluctuate. We all know that they do, and today they are fluctuating at lightning speed. The advent of electronic trading, exchange-traded funds (ETFs), and retirement accounts that can be switched with a click or a call has led to an avalanche of trading. TD Ameritrade, a brokerage that caters to individual investors, has seen its average trading volume per account rise around 60% in the past 10 years. Other brokers have had similar results. This trading adds to the volatility of markets, which in turn increases investor anxiety. Emotions overwhelm rational thinking, herds of myopic and fearful investors are formed, and investment prices eventually become unhinged from their fundamentals. Wise investors understand these forces and put themselves in a position to be successful, even if doing so means accepting some short-term performance bumps along the way. In past newsletters, I have discussed the five poisons of investing we must look out for, especially in times of heightened volatility. 1. Recency effect: Giving recent history more weight in a decision than it should get. 2. Endowment behavior: Our desire to hold onto something even if it is no longer useful or is unhealthy. Think habits of the mind, beliefs, etc. 3. Fear and inertia: Some people react fearfully to information overload or the possibility of a loss (e.g., sell everything NOW). Others just go into the fetal position, so to speak, and do nothing when they should be taking action. 4. Narrow investor’s universe: Limiting a portfolio’s holdings to just U.S. stocks or large “blue chips” can seem safer, but there is a downside to this behavior. Study after study show that expanding a portfolio’s holdings, adding global investments, bonds, resources, etc., actually reduces risk and improves consistency of performance. There is still volatility, but there is more likelihood of achieving a long-term investment goal. 5. Heuristics: Skewing the importance of certain information to a larger or lesser degree than warranted by the information. I will not add naiveté, but the quote to the left that I recently read by Edgar Degas comes to mind when I think of how people can fool themselves into thinking this investing stuff is easy. FIM Group COO Matt Bohrer (my colleague for nearly 20 years) told me a story he heard recently from a fellow adviser who was trying to communicate to a group of investors the folly of ditching a long-term investment plan to do what many seem to be trying today: market trend following. These investors try to buy when it looks like there is momentum to the upside and sell when there seems to be momentum to the downside. They are enabled by invest-ment industry “technology advances” that allow for shifting the stock/bond/cash mix of entire portfolios with one click of a smartphone. When these investors told the adviser how they were doing this with their mutual fund 401(k) retirement plans, the adviser asked them if they realized that the mutual fund “trades” they were putting in at eight in the morning didn’t actually do anything other than sit in an order pile to be executed at the end-of-day price (like all open-end mutual fund orders). The adviser got some sheepish looks and left the event wondering how many other investors are behaving this way. My guess is that many similar types of investors who tried their hands at short-term market trend timing got bruised quite a bit in August as markets whipsawed. 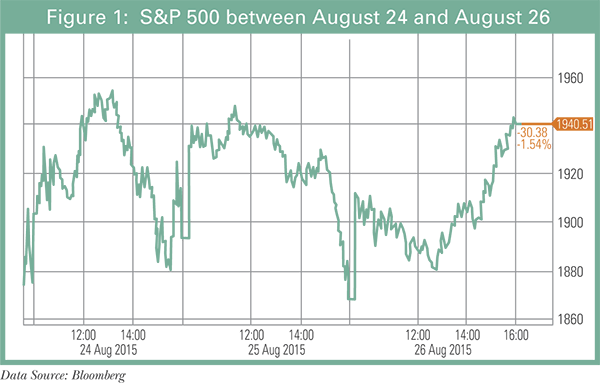 For example, look at the wild intra-day swings we had in the S&P 500 between August 24 and August 26 (Figure 1). Those waking up to the sharp drop in markets on Monday, August 24, might have put sell orders in first thing only to see markets rally sharply in their face through the lunch hour. Then, in a bid not to “miss out” on the rally under-way, these momentum chasers likely shifted to buying the market only to see momentum reverse back down to close near the lows of the day. Vowing to make up their losses the next day, they likely cheered the market opening rally, went “long and strong” only to see the rally fade fast and make new lows for yet another day. Then on Wednesday, perhaps thinking there was a pattern to exploit, they bought another market opening rally and then sold short the market as momentum picked up to the downside. Yet before they could recoup their losses from earlier in the week and cover their short positions for gains, the market surged higher, compounding their losses further! Emerging markets can’t catch a break of late. Generally speaking, their economies and their stock and bond markets have been savaged by changes in capital flows, economic uncertainty, political upheavals, banking stress, currency volatility and poor investor sentiment (being driven by fear). Emerging economies as a whole tend to have better long-term growth prospects than developed economies, but today, their stock markets sell at a 20%-30% valuation discount to developed markets (as proxied by the forward price/earnings and EV/EBITDA ratios of the MSCI Emerging Markets and Developed Markets Indices). Without a doubt, many of these emerging markets still face some near-term headwinds. U.S. dollar strength challenges the liquidity of countries from Russia to Brazil, and weak crude oil and metal prices have wreaked havoc on countries dependent on revenues from commodity production. While our direct portfolio exposure to emerging markets is limited, some of our holdings have seen their market values erode amid the emerging market selloff. We see real value in high-quality stocks and bonds that have been thrown out with the proverbial bathwater just because they have emerging market exposure. One example holding along this theme, held in most of the portfolios we manage, is Atrium European Real Estate (Ticker: ATRBF). Atrium owns, develops and manages retail real estate with a focus on supermarket-anchored shopping centers in Central and Eastern Europe. Atrium pays a 7% cash dividend, sells for about a 25% discount to its book value and has great seasoned management. The company has a solid balance sheet but, oh yes, now the rub, it has seven properties in Russia that represent about 20% of its revenues. We believe that the Russian properties will continue to generate income (after all, even Russians eat), and that the book value of Atrium has already been sufficiently “written down” to reflect its underperforming Russian assets. We do NOT expect a miraculous V-shaped Russian economic recovery near-term as the country is not well run and it has a heavy dependence on oil and gas that could remain weak for some time. That said, we feel that Atrium has been overly punished for its exposure to Russia and that, at these prices, even if the Russian assets are marked down to zero, our shares would still be selling below book value. In the meantime, management is growing the business, rents have been rising on their non-Russian assets and Atrium has 12% of its assets in undeveloped land, which they can develop to generate even more income to investors. Despite the Russian malaise for over a year now, Atrium’s three-year dividend growth has been 18%. There is considerable talk that China’s economic woes could drag the U.S. into a world recession. Could that happen? Sure it could. Recessions happen and then economies eventually get back to growth. As it stands today, prices in many bond and commodity markets (and the above-mentioned emerging stock markets) seem to already be pricing in the increasing risk of a global economic downturn. But amid the doom and gloom, America Inc., which accounts for roughly 25% of world GDP, is showing some positive trends. Our second-quarter GDP growth was a pretty solid 3.7%, our unemployment rate is near 5% and the oil price drop has put more money in American pockets as we pay less to keep our cars full of gas and our homes at comfy temperatures. The strong U.S. dollar allows us to get more bang for our buck on imports, and when you look at big-ticket items, the trends seem to be pretty decent too. Car sales are hitting new records (I was born in Detroit, so I feel compelled by DNA to follow the auto industry – as “GM goes, so goes the [American] world”). 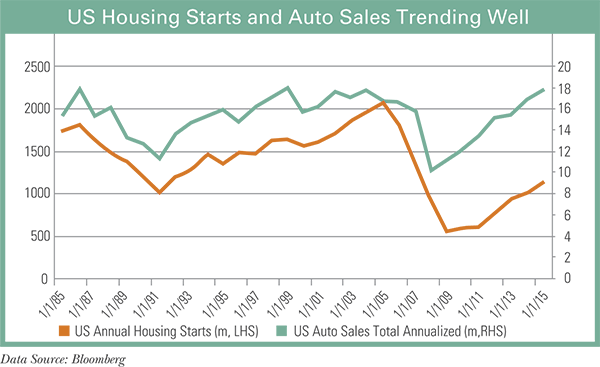 Housing starts, while still well below long-term averages, are showing nice momentum, and the U.S. consumer is much better off than a few years ago (see Figures to the right). In short, it seems that at minimum, the U.S. economy is better positioned to deal with global recession should that be what comes our way. More optimistically, the U.S. may prove to be the global stabilizer as China transitions to a slower economic growth trajectory. Fears around what the Federal Reserve will do with interest rate policy at their September meeting have been a big topic this summer. Now we know what they did – very little (On September 17, the Fed announced it would keep short-term rates unchanged at zero). In the meantime, though, financial media seems obsessed over and likely even contributing to irrational Y2K-like fears that a Fed shift away from its zero interest rate policy will wreak profound change on the economic landscape. This fear has trickled down to bond-land, where some investors have become afraid to own corporate, government and inflation-linked fixed-income investments. The Fed was created by Congress “to provide the nation with a safer, more flexible, and more stable monetary and financial system.” Smart people work at the Fed, they debate policy options with rigor, and they make decisions with a desire to minimize the risk of “screwing up.” Making the Fed out to be all-powerful economic agents is a meme that sells newspapers and gets Tea Party candidates elected. But the Fed is not the economy, nor is its action in setting interest rates and buying and selling bonds the economy. 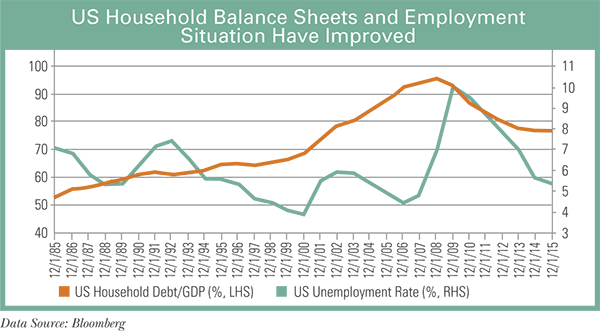 We feel that the hyper-obsession with Fed policy and fears of where short-term rates will be set is overdone. It has also created a significant opportunity to own quality, solid interest income investments at price levels not seen for many years. This is great news for retirees and income-oriented investors as we can lock in significant, contractual income streams across a wide range of investments, including the floating rate investments we’ve been buying of late whose distribu-tions will actually increase should rates finally begin to move higher. This has been one of the toughest periods of my career. Throughout our history, we have been early into trends, but not too early, and usually we avoid the big losses by using a “look at the downside twice – upside once” conser-vative, value-based approach. We have had periods like this in the past where everything bad seems to happen at once, and I’m sure we’ll have them again someday in the future. But our history shows that these tough periods are followed by good periods. I must say that I am very optimistic that our portfolios will eventually reflect the compelling value within them and that we will someday be saying to ourselves, “I wish we had more bargain-basement investments to pounce on like we had in the summer of 2015.” The reality is that markets, which are made up of people, driven by emotions, fear, greed, logic and such, tend not to be steady Eddie. More often, market participants lose sight of long-term financial plans, get suckered into “fad du jour” investment strategies, and turn to the crowd for comfort only to get burned. Our job as your money managers and financial advisers is to stay disciplined, thoughtful, savvy, patient and value-focused like we have throughout our long history, navigate you through the bumps along the way, and work together with you to successfully achieve your personal financial goals.